This Dream Machine, the Britax B-Agile 3, arrived in our house recently and I was so excited about it that I asked the OH to put it together before I got back from work. I say put it together, all that involved was putting the wheels on and the hood on, I think I could have done it myself. I'm told that as soon as it was up Isla and Noah were pushing and shoving to get in it first - they were pushing each other round the living room it was *THAT* exciting! This was all before I got home. So I was pleased to see that the new wheels had been gladly received. I do love a buggy, I think if you have a good one it can be the best bit about buying and using baby equipment. It's such a huge purchase and you have to research it well. We've been sent this buggy as part of the Britax 'Mumbassador' (this makes me think of Ferrero Rocher every time I say it) programme and I was really quite flattered to be asked to join the Britax team. As a family we have never tried any Britax products so I was interested to see how I would take to a new brand. Before we owned the B-Agile I think I felt the name Britax was synonymous with safety and quality and with this buggy they have come up trumps. It's lightweight, easy to manoeuvre and sleek. The harness is safe and easy to fix and the frame feels really sturdy. It's already had the thumbs up from my mum, she says she thinks it's so lightweight that Britax must have been thinking of the Grandmas' when they designed it. She said 'it's brilliant, so easy to push, it just glides'. So there you are, one happy Grandmother. We've used it a fair bit for Isla and Noah and I would say that so far my favourite bits (apart from how easy it is to get around with) are the massive hood that extends further still when you unzip it and it has a mesh section so you can look directly through the hood to see baby. Great for checking if baby is asleep. Also I love the basket underneath which is great for when you do a little top up shop and you don't want to carry shopping bags. There is also a very nifty storage pocket in the the canopy for keeping important things to hand like keys and purse. 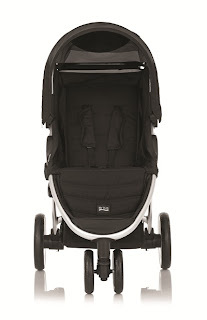 We were sent the Britax B-Agile 3 to review - all words and opinions expressed are my own. Over the coming months we will review Britax products and let you know of latest news, offers and updates - keep your eyes peeled!